u-blox has introduced the latest member of its ZOE-M8 series of ultra-small GNSS SiPs. The ZOE-M8B is the most power efficient GNSS System-in-Package (SiP) available for small battery powered consumer devices. 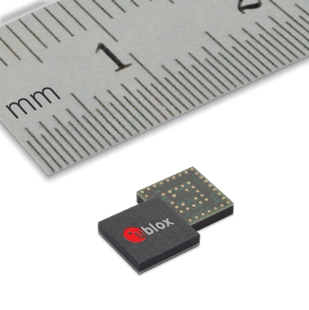 It combines superior performance with ultra-low power to deliver an optimized solution for portable and wearable devices targeting the fitness, health monitoring, and personal tracker markets. Small battery powered devices are defined by their limited size, weight and power, which dictates that any GNSS solution targeting this application space must provide exceptional performance while consuming minimal system resources. The ZOE-M8B has been designed for this class of ultra-low-power applications, where size and power are critical parameters. The ZOE-M8B consumes 25 mW on average in most environments (including urban), and as little as 12 mW during instantaneous tracking. This is a three-fold improvement in power efficiency when compared with other variants in the ZOE-M8 series. This combination of ultra-low-power operation and high performance is thanks to u-blox's proprietary Super-E mode of operation, which automatically adjusts the power consumed by the system components based on the external conditions. The footprint of a design with a chip and individual external components is about 50% larger than the PCB footprint of the ZOE-M8B. Measuring just 4.5 x 4.5 x 1.0 mm, the ZOE-M8B integrates a GNSS receiver, TCXO, SAW and LNA in a single package, making it easy to add accurate location and positioning functionality to almost any device. The ZOE-M8B is the latest addition to the ZOE-M8 GNSS module family, which consists of the ZOE-M8G for 1.8 volt powered devices and the ZOE-M8Q for 3.0 volt devices, both focusing on maximum accuracy. For more information on ZOE-M8B, come and visit the u-blox booth N.352 (M2M Zone) at MWC Americas, held on September 12-14 in San Francisco. Click here for more information.